by Daniel Keever on October 22, 2018 . Having a digital marketing strategy is a must for companies looking to compete and grow in the modern business world. For companies looking to invest in digital marketing, getting started can seem like a daunting task. With so many factors – websites, advertising, SEO, social media, etc. – digital marketing may seem more complicated than you want to deal with. What you need is one, simple, step-by-step digital marketing strategy to get you set up and on your way. It is a checklist of all the foundational pieces you’ll need for an effective digital marketing strategy. It is a guide to creating a successful approach at every step of the buyer’s journey. It is a collection of resources that go into detail on specific topics you may have questions about. The first order of business is your website. If you don’t have one, you need one. If you already have one, odds are that it could use a little bit of help on its way to being a lead-generating machine. Let’s jump right into it with some simple, actionable points. As you might expect, if you don’t have a website, you need to get one. But it’s important to pick the best option for your needs and your budget. There’s a few ways you can go about creating a website to serve as a base for your digital marketing strategy. The first way is the DIY route. This route has grown in popularity in the last few years because of the improved, easy-to-use programs such as WordPress, Wix, and Weebly. They are specifically crafted to make web design easy for those of us who aren’t quite professional coders. As you might imagine, they’re the most affordable option, but as you also might imagine, there are some downsides to the DIY route. For example, if your site is hacked or if there’s a glitch in an important contact form, you very well may be out of commission until you get professional help. Doing your own website has its upside – mainly the cost – but we would not recommend it unless your budget requires it. The second option is to outsource your website creation and/or support. While you may pay a little more than your standard domain name and hosting fees, you get a substantial boost in security and capability. Solicit reviews. The more, the better! You want both more stars and more reviews. Respond to reviews. Not only will it show you care, but it will also tell Google that you are an active business that cares about its customers. Some business owners groan when they think of social media. For many, social media doesn’t seem worth their time, but with a new generation of consumers, an inactive social media is like having cobwebs on your door. If you want to know about social media strategy, we will get into that below. Social media is an important part of your brand because it gives your customers an opportunity to stay engaged with your brand and become ambassadors for your brand by interacting with you. But if you’re still wondering if you should even get started, we would recommend opening a Facebook page for your organization. Facebook is a great starting point for your social media presence for a few reasons. 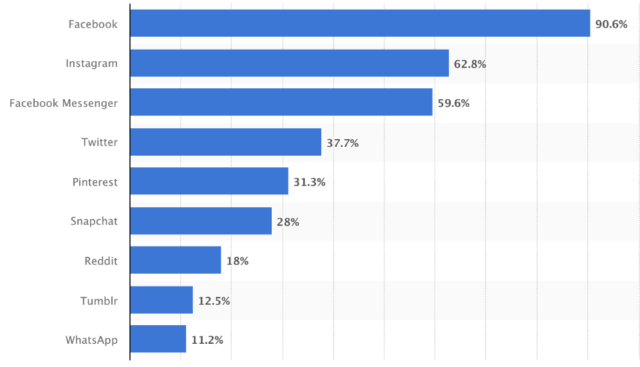 First is that Facebook is the most popular platform, especially in tandem with the rise of mobile. Facebook is used by a whopping 90% of mobile users. The other reason we recommend Facebook as a starting point is the comprehensive nature of Facebook’s features to promote your company. You can (and should) do much more than just make posts occasionally! You can create and share events, integrate a call to action, post job openings, and dabble in easy paid promotions all in one place. If you’re serious about digital marketing, start with these pieces of your foundation. With a website, a My Business listing, and a social media presence, you’re ready to begin building out your digital marketing strategy! Online advertising is the fastest way to jumpstart online traffic and business growth. It lets you cut to the front of the line, meeting the right customers at just the right time. There’s a few different ways you can advertise. If you’re planning on doing this yourself, we recommend you start with one, get to know it, then expand to other platforms. Honestly, we recommend outsourcing it rather than investing all of the time necessary to become proficient enough to make it worth your time. If that’s an option you’re considering, check out our by-the-numbers comparison: In-house or Agency? If you are planning on doing your own online advertising, here’s a more thorough strategy guide on how to maximize your ROI – The Best Online Advertising Platforms and How to Use Them For now, we’ll give you a high level view of your options with online advertising. Use Low Competition Keywords – Try to find keywords with fewer advertisers competing for them to lower your costs. Use “Longtail Keywords” – These are longer keywords designed to filter out prospects who may be interested in offers that are similar to yours but not actually yours. Add in geographical or any industry keywords for more precise targeting. Target Intent Keywords – Don’t just target categories. Target actions. For example, an HVAC company would target “air conditioning replacement/installation/repair” instead of “air conditioning”. So where do you do this? We would recommend Google Ads as a good starting point. 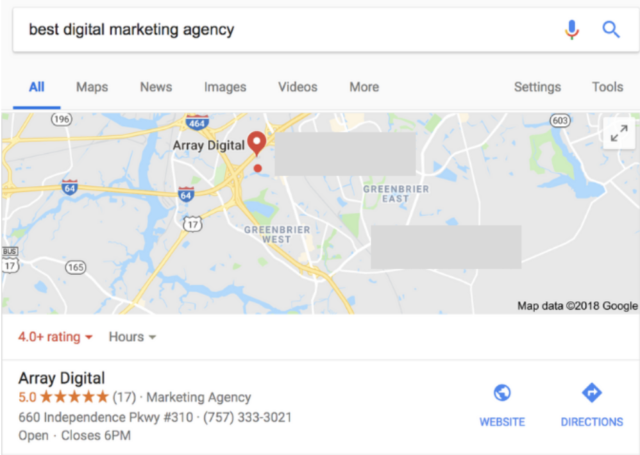 Google has the overwhelming majority of web traffic, but we will warn you: if you’re not experienced with Google Ads, they will be more expensive and less efficient at first. Another easy starting point is Google Express, which you can manage right from your Google My Business listing. It’s like Google Ads Light – it’s a little bit easier to use as well if you find Google Ads confusing. Once you feel comfortable with Google Ads, a second option is Bing. Bing still gets 10% of all Internet search traffic. According to ComScore Desktop Search Engine rankings, Bing gets approximately 123 million searches per day! 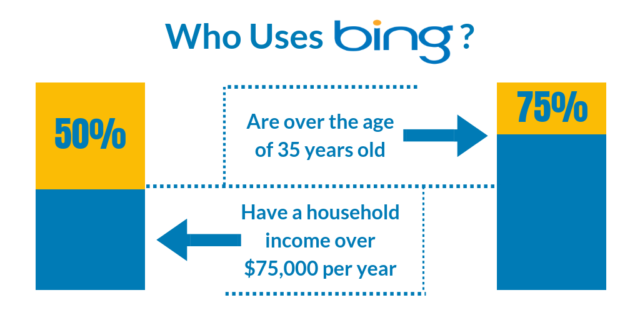 To make Bing even more interesting, their average user is older and more financially established than the average Googler. All of this combined with less advertising competition makes Bing an intriguing option for online advertising. Another form of online advertising is display network advertising. When done correctly, these can be some of the lowest cost per click (CPC) advertisements you can run. They have a lower click through rate (CTR), but ultimately, you get far more clicks for your dollar. You can use these to build brand awareness, retarget website visitors, and more! For more on these strategies, check out the Display Ads section of The Best Online Advertising Platforms and How to Use Them. Advertising on social media can serve a variety of purposes in your overall digital marketing strategy. As you might have guessed, you can use advertising to build your social media following with page and post boosts, but you can do a whole lot more than that as well! You can use Facebook ads to precisely target your audience based on their demographics (age, gender, geography) and psychographics (interests, affiliation, etc.). You can also use what’s called a “Facebook pixel” to retarget users from your website. With these off-platform goals, you can leverage social media’s immense data pool to target your ideal clients. When it comes to search engine optimization (SEO), the entire goal is to be the first option presented to individuals who are searching for your goods, services, or brand. SEO is the long-game strategy, but by consistently doing a few simple things, you can build up your brand to the point that leads will frequently come in organically (without spending more advertising dollars). These key things should be a part of your SEO strategy. The goal of SEO is to help Google see that your website is relevant to people searching for your potential goods and services. Some people think this means you should just start “keyword stuffing” – filling up every page with an abnormal amount of keywords. 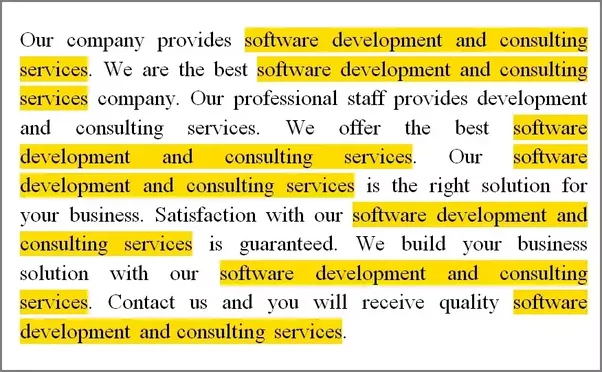 Take the example below who apparently does custom software. Does this read like a normal person would write? No! And now Google knows this too. This kind of content will no longer help you rank higher in search engines. You want content that is genuinely useful to your visitors. Take the time to create quality content on your website, targeted at your core keywords. So what do you do? Blog, and blog frequently! We recommend at least two quality blog posts per month. As we noted, Google wants to see that people who come to your pages are finding what they need. They look to two main statistics to determine how useful your content is. The first one is click-through rate (CTR). CTR means that when people visit your page, they click on something there that takes them to a new page. Google interprets this as them having found something they were looking for or at least something interesting. What does this mean for you? Make sure your site has clear, simple navigation options to help people find what they are looking for quickly. Also, include useful or entertaining resources on your pages to engage your traffic. When some people think of SEO, they only think of someone behind a desk, typing away, but the most successful SEO efforts leverage real relationships, events, and more. 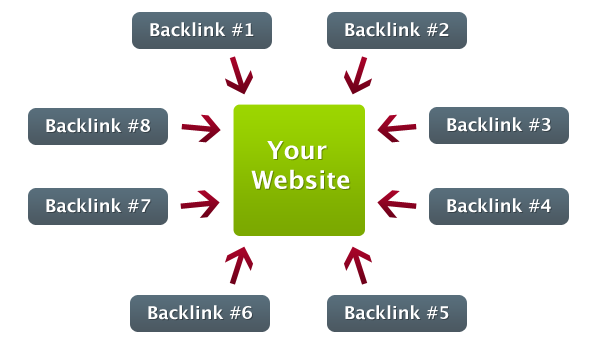 A significant part of your SEO value is a tactic called “backlinking”. To put it simply, backlinking is getting links to your website on other websites. Not only does this drive traffic from their website, but it is a significant part of how Google determines what websites are more trustworthy. There used to be a strategy where SEO marketers would try and get their links spread around thousands of websites whose sole purpose was building backlinks. Over time, Google caught on and began penalizing backlinks from websites that didn’t have a good “domain authority”, or high credibility. If you’re just getting started with backlinking, we recommend holding off on spamming websites for backlinks. Instead, leverage your personal and social networks to build up links. Offer to guest post on someone’s blog. Distribute significant company milestones or events to your local news outlets. Anything you can do to provide value to someone else in exchange for a link leading back to your site is a good start! For many business owners, social media seems like a hassle or it’s just too confusing to really be worth their time. But why is it that the most successful brands put significant time and energy into building their social media following? Because it works! Social media is not an arm of your sales team. It doesn’t work for many businesses because they only post “buy this” or “we have a special sale” and expect their audience to love it. Now we aren’t saying that you should never post a sale or a product on your social media, but if that’s all you do, your social media will be a flop! We’re here to help you get started in the right direction with your social media. There are three things you need to know about making a content strategy. First, your content needs to revolve around your audience, not just whatever you want them to know. You need to plan content that engages them for a variety of reasons. A common complaint of business owners with social media is that it takes too much time. They don’t remember to go on and post the things they’ve planned. Tools can help you! Start saving your time with a scheduling tool! If you use Facebook, you can do it through “Publishing Tools”. 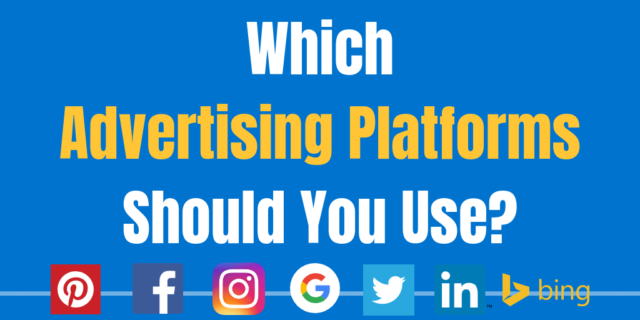 If you use any other platforms, you can leverage a tool like Hootsuite or Buffer. Warning: Don’t fall for the trick of automated social media posting. Most people see right through it, and it reflects poorly on your brand. Up your social game with some simple, inexpensive visual tools too. Need some help making attractive graphics? Canva is like Photoshop for all of us who aren’t exactly “creatives”. Or make attractive videos with Veme.ly that boost engagement and reach. Take some time to surf the app store to see all the new tools that come out every month! Every social media platform is unique with its own audience and specific behavior styles. For your brand, you want to find where most of your audience is “hanging out” online and build a presence wherever they are. We recommended Facebook above because it is the most all-encompassing platform with the most users and the most functions. But what else is available? Let’s round out our top 5 social media platforms. Facebook and what else? Who It’s For: Brands with interesting products, events, office life, or anything else visual. How to Use It: Post frequently with pictures that show the personality behind your brand. Include events, staff members, and anything “behind the scenes” that you can! Who It’s For: Brands whose ideal kind of prospect is already active on Twitter How to Use It: Twitter is half what you post and half engaging with other people’s tweets. To get the most out of this platform, be extremely proactive in conversing with other users. Who It’s For: B2B companies looking for new clients and reputation building How To Use It: Way too many people treat LinkedIn like a resume. It’s not. Use it like a business card instead! Expand your network, engage your dream clients. You want to build your personal brand by showing that you are knowledgeable in your industry. Who It’s For: Brands with much younger clientele How to Use It: Snapchat content needs to engage your audience immediately, creating intrigue, laughter, or some other emotion right out of the gate. So what’s your next step? You have 3 options. If you don’t have much breathing room in your budget for digital marketing, use this as a guide to help you get started. Keep it simple, and don’t spread yourself too thin. Don’t try to do everything at once. Instead, become proficient at a few things to make them really work for you. If you have some financial flexibility, you can bring on an employee or even an intern to help bring some specialization to your team. It should be noted though that you can get more expertise for the same price by outsourcing with an agency. The only time we recommend you start with an in-house employee or team is if you have a high volume of content for social media that you need full-time commitment for. If you want to learn more about what it’s like to work with a digital marketing agency, let’s chat! See what we’re all about, and give us a call or shoot us a message!